Tracksounds: Win the Star Trek (Soundtrack) by Michael Giacchino! 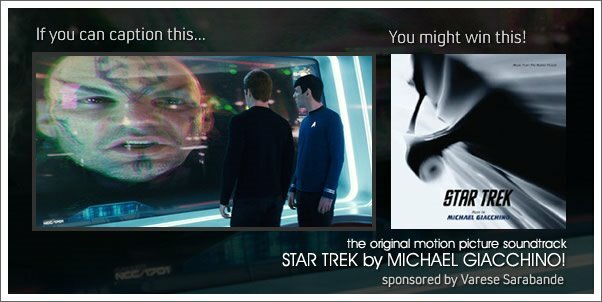 Win the Star Trek (Soundtrack) by Michael Giacchino! Oh yes! Oh yes! The caption contest is back! Not only is it back, but it's all new - making entering the contest even easier than before. To mark this special caption-occasion, thanks to Varese Sarabande, the prize for contest #93 is none other than the original soundtrack from STAR TREK by MICHAEL GIACCHINO.